Are you using Pinterest strategically as a wedding professional? Wedding inspiration is a huge search interest on Pinterest. Pinners are using Pinterest everyday to plan for their future or upcoming wedding. On the blog, I’m sharing 5 tips for using Pinterest for your wedding photography or planning business! Weddings are HUGE on Pinterest! In fact, according to this article from Pinterest, there are 3 billion wedding pins on Pinterest alone. That number is probably a lot higher in 2018. Pinterest is the perfect place for weddings, coupling inspiration and planning. When I got married in 2007, I had to plan everything out the old-fashion way. Grab bridal magazines, cut with scissors and paste on a tangible mood board to achieve the perfect wedding look. I resorted to some technology by using clunky bookmarks of my favorite Google searches or purchases to make. By the time my first child was 1, Pinterest was born and party (and wedding) planning has never been the same. So, now that you know there are a lot of pinners who are looking for wedding inspiration, how can you, as a wedding professional, use Pinterest to book clients? The most important step any business can take on Pinterest is to convert to a business profile. See why this is important in this post. Having a business profile enables you to confirm your domain, which will lead pinners (and hopefully, future booking clients) back to your website. Create 10 niche-specific boards on the popular wedding-related topics mentioned above to create a catalogue of your photography or wedding planning style. Use board names like wedding gowns, engagement portraits, bridal bouquets, wedding centerpieces, etc and fill those boards with pins and images of weddings you have photographed or planned. Use other inspiration you’ve found on Pinterest to pin to those boards. Pinterest as a platform prefers vertical images with a 2:3 ratio. Start with 1000x1500px images. Showcase your beautiful wedding photos with a branded image by dropping your logo or watermark into the bottom center of your photo. Having a branded image is important. It gives context to your future bride—if she sees a style she likes popping up all over Pinterest and can clearly read your logo, she might book you for her wedding. Get 3 steps for creating traffic-generating pins here! Do you blog for your wedding business? If you aren’t, blogging is a great way to showcase your work, style, and venues. Make sure each blog post has a Pinterest-friendly image and that you share it on Pinterest to your own personal brand board and niche-related boards that fit the content. Create blog posts that highlight a specific wedding style—a beautiful blush and navy wedding in Dallas might attract the Dallas bride looking for a photographer or planner to book with that style. Use ‘search friendly’ keywords in your pin descriptions. Do you have a website that easily converts visitors to leads? Make sure you have a visible ‘about page’ or ‘contact me’ link so that brides can inquire about your services. If your website isn’t easy to navigate, you might be losing potential leads. One of the most important things you can do is to be consistent on the Pinterest platform. Pinning 5 pins a day and creating one piece of content a week from your website is a great way to grow your traffic from Pinterest. Short on time? 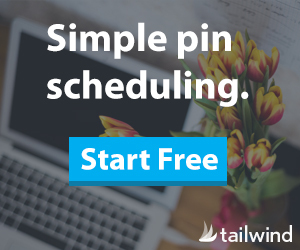 I use Tailwind, a Pinterest and Instagram scheduler, to keep my Pinterest account active. I have a lot of tutorials and posts detailing why I love Tailwind. Read them here. Want to hear more? I hopped on This Week in Weddings Podcast on Maximizing Pinterest for Your Wedding Business. Listen in here! Are you new to Pinterest and want more tips to get started? See my introductory post Getting Started on Pinterest and don’t forget to sign up for my email newsletter below. You’ll receive my FREE Pinterest Start-up Guide for your creative small business where I give easy actionable steps to getting started on Pinterest! Ready to automate your Pinterest marketing strategy? Learn from my How to Use Tailwind course!